The slow cooker isn't designed for roasting, but you can poach a turkey in one. 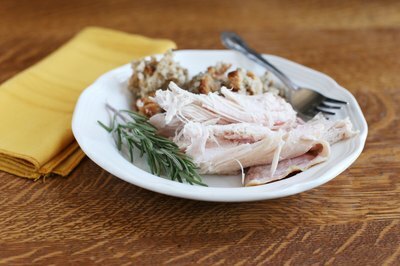 Use this approach when you want shredded turkey meat for a casual meal, rather than a beautifully roasted holiday turkey. The slow cooker is just that -- slow -- so allow several hours, or even a whole day for cooking. Large 6- to 7-quart slow-cookers can hold between 8 and 10 pounds of meat -- considerably less than the average 14-pound turkey. Choose a small turkey, cut the turkey up, or opt for a boneless or bone-in turkey breast. 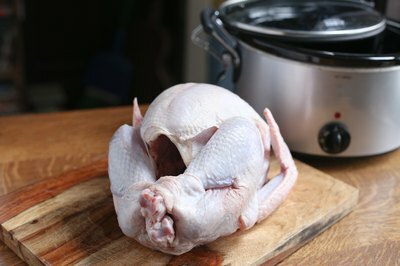 Although some recipes may recommend placing small pieces of frozen meat in a slow cooker, you should completely defrost a whole turkey or turkey breast to reduce the risk of food borne illness. Remove the neck and giblets, and rinse the inside of the turkey well before placing it in the slow cooker. To thaw a turkey, place it on a tray in the refrigerator one to three days before you need it. Once thawed, the turkey must be kept refrigerated and used within one to two days, according to the U.S. Department of Agriculture. Most turkeys are processed in a sodium solution so they already contain some salt. They're a bit bland, though, without extra seasoning. Place some chopped onion, celery and carrots in the bottom of the slow cooker. These aromatic vegetables add flavor not only to the turkey, but to the broth which can later be used for gravy. Season the turkey with salt, pepper and any desired seasonings, such as thyme or rosemary. 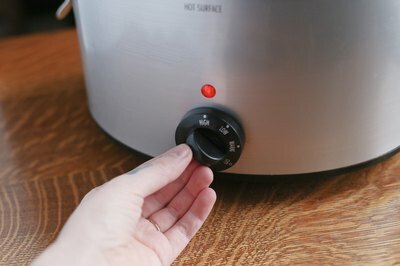 The slow cooker requires moisture to cook efficiently. 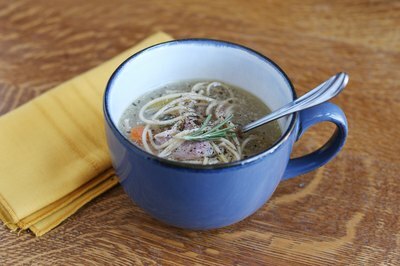 Pour a cup or two of chicken, turkey or vegetable broth over the turkey. Turkey is highly perishable so you want it to reach temperatures above 140 degrees Fahrenheit -- the temperature at which bacteria is less likely to grow -- as quickly as possible. Place the lid on the slow cooker and turn it to HIGH for the first hour. Reduce the heat to LOW, and continue to cook the turkey for 6 to 8 hours. The turkey is done when it is very tender and an internal meat thermometer registers 165 degrees Fahrenheit. Slow-cookers are convenient because they require very little supervision. One drawback, though, is that they won't brown a turkey the way the oven does. Turkey cooked in a slow-cooker is best used in soups, stews and casseroles, rather than served whole. The meat will be very tender and juicy, but rather shapeless. To make a gravy from the broth, transfer the turkey to a carving platter. Turn the slow cooker to HIGH. Combine equal parts flour and butter to make a smooth paste. Stir this paste, known as a beurre manie, into the broth in the slow cooker, and allow it to cook for several minutes until thickened.